BEAUTIFUL ! so classy... I used in my master bath. 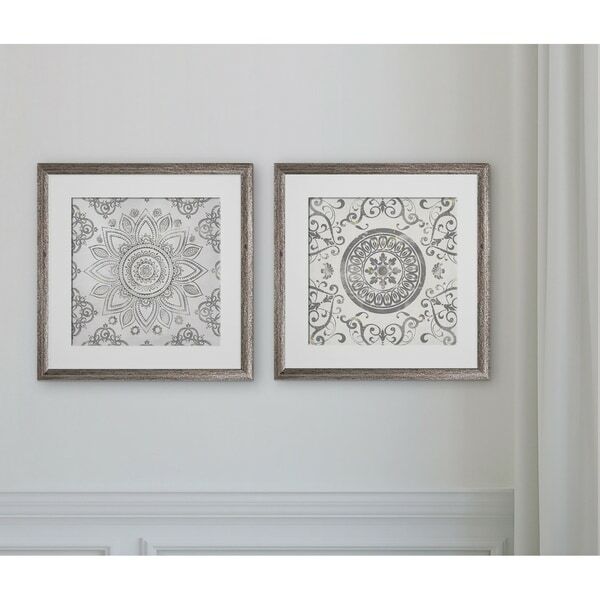 Mandala Sunburst -2 Piece Set 2 Custom Framed Prints. 100% and created to last. Individually printed and framed by hand to very high standards. Printed and inspected one at a time utilizing the latest archival UltraChrome Giclee inks Consisting of 2 Total Framed Pieces Each measuring 16''x16'' x .75'' deep Each Piece is Individually Framed Acrylic Glass Each piece includes hanging accessories and is ready to hang. You need only to apply an anchor to the wall of your choice. This is very accurate as in the advertisement pictured by overstock. I was concerned that is would be a faded looking picture or have cheap/tacky frames. It's not. It's a nice subdued grey print. The frame looks like a grey-washed rubbed wood. It's very simply stated pieces. Very cute! The frames are very light weight but from a distance it looks great. Needed something for a small accent wall and these worked out great. I wish three was another set for the other side! Very pretty! The frame is much darker than in the picture. Almost black. Frame does feel a little cheap but overall this was a good purchase for the price. Nice pictures if you’re just looking to fill space on a wall.